Just A Car Geek: 1961 Saab - Oldest Known Saab Station Wagon in the US? 1961 Saab - Oldest Known Saab Station Wagon in the US? This eBay listing caught my attention. First of all, I like old Saabs. They were weirdly cool. But secondly, in his listing the seller states, "I have been told by the Vintage Saab Experts that this may be perhaps the oldest known Saab station wagon to exist in the United States". That kind of claim makes me skeptical and curious, so I did a little research. He's right. 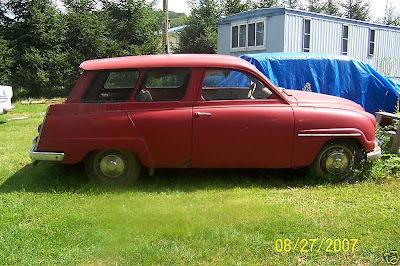 I could not find another listing or mention of a surviving 1961 Saab wagon anywhere in the US. A 7 seater, 2 door wagon, these cars had Saab's famous and fun 3 cylinder, two-stroke engine and "freewheeling" transmission. It seated 7 by having a little rear facing seat in the back. That seat folded away when more cargo space was needed. Cool little touches include a column shift and rectangular gages. This car is a "barn find" that was last inspected (and presumably registered) in 1978. For a car that has sat for 30 years it's in pretty good shape. The seller states the car has some rust on the "lower panel" behind the passenger side door and there appears to be some minor surface rust here and there, but all-in-all the car looks to be solid and straight. From the pictures it also appears to be very complete. It should be noted that the pictures were taken in 2007, so ask the seller plenty of questions (and for recent pictures) if you're planning on bidding on this car. This is a nice, possibly historical, old Saab that deserves a first class restoration. Click here to see the eBay listing for this Saab 95. For more info on this and other Saabs, click here to find the SaabHistory.com website. I also have a 'thing' for old Saab's. Right up until the early 90's they were fantastic, even the odd looking Sonett, loved them all. This would be an amazing project, if I had the room, and the money, and an understanding wife, I'd be buying it! What a great find. Let's hope somone buys it and restores it to its original glory.